The MAZ-537 was a Russian 1960’s designed tractor unit used to pull trailers across rough terrain capable of supporting/carrying the weight of Main Battle Tanks and was based on the earlier but similar MAZ-535, which was used to tow the R-14 IRBM (intermediate-range ballistic missile). The use of a 8×8 chassis gives these vehicles a high level of mobility off-road and towing capability of trailers supporting the weight of Main Battle Tanks up to 70 tonne in weight. 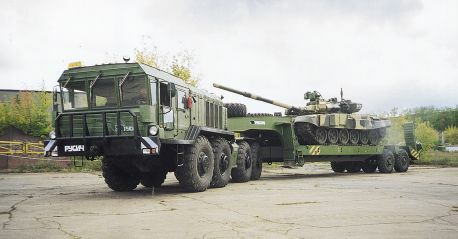 The Russian KT-7428 Military Tractor Unit is another in these successful Russian 8×8 tractor lines. It entered service with the Soviet Army in 1981, replacing the production the previous MAZ-537.